Shukishi and Tomi do not need money from their children. They don't need a place to live. They have their own home, and they seem comfortable enough in it - they even have a young daughter, an unmarried schoolteacher, who still lives with them. There is no crisis in their lives - no overt crisis anyway. This is, in a sense, the tragedy of Yasujiro Ozu's Tokyo Story: there is no great tragedy just simple sadness and disappointment, without catharsis or indignation to leaven the melancholy. In one of the film's famous exchanges, the youngest daughter, wearing an expression of strained frustration, asks her sister-in-law, "Life is disappointing, isn't it?" "Yes, it is," the other woman responds. With a smile. That smile is quintessentially Ozu (no less because its worn by Setsuko Hara, the director's favorite heroine): stoic grace in the face of life's withering challenges. I've never seen Ozu as a "transcendental" filmmaker because his characters don't seem to overcome or transcend their obstacles; they simply endure them best as they can. This is a cinema of resignation. Yet it is far from bitter resignation, and indeed there is usually a kind of joy. The exceptions, like Tokyo Twilight, are exceptions across the board - outright tragic so that the lack of joy is not a subtle difference. With this in mind, it's a bit curious Tokyo Story is often featured as the masterpiece and/or token Ozu on any greatest-films list; indeed, I knew right away it would be among my "Big Ones" due to its reputation. 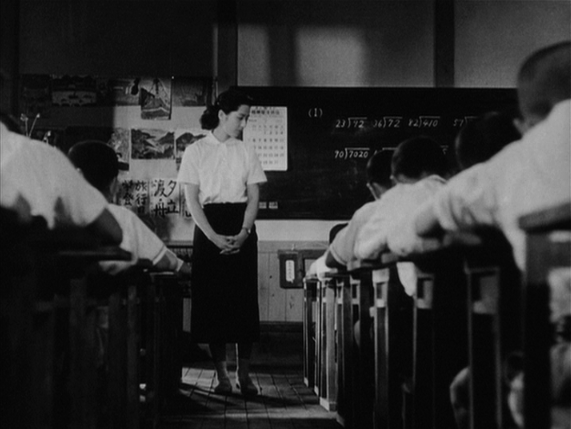 It's curious because Tokyo Story isn't tragic, at least not in the desperate, almost melodramatic terms of Tokyo Twilight, yet it mostly lacks the sense of joy or quiet bliss that other Ozus employ to temper the weary wisdom. Indeed, at times it does border on bitterness or at least a kind of depressive despair. Perhaps for this reason, it is not really one of my favorite Ozus, so I often wonder how it achieved the status it did (I find Late Spring his most engaging and moving picture). It could just be some issue of timing, but I think there are some fundamental reasons: for one, the film's theme is more universal than other Ozus - because it's about neglecting parents rather than arranging marriage (something which hardly pertained in the West by mid-century). 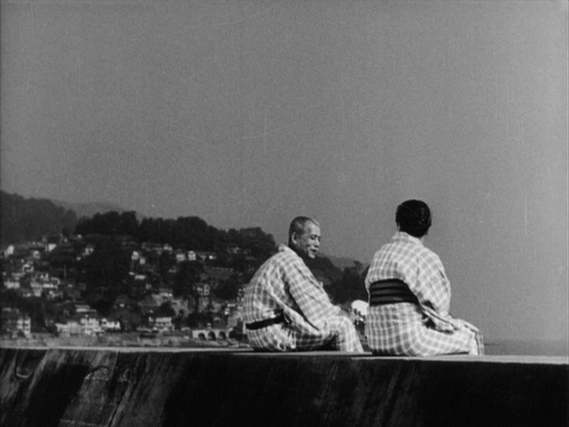 Furthermore, Tokyo Story has a kind of starkness which makes it stand out in Ozu's body of work - a bleak focus on the situation that marks it out from the other movies with their mixtures of quiet and conviviality, tradition and modernity, cheerfulness and sorrow. The old couple (Chishu Ryu and Chieko Higashiyama) seem lost and withdrawn throughout, their situation worsening but not fundamentally different from their arrival at their son's house in the beginning. Their only moments of true happiness come with Noriko (Hara), who isn't even related to them by blood - she's the widow of their son, who died in the war. Yet both the couple and Noriko are marked as outsiders so even their enjoyment seems shadowed. Tokyo Story makes an interesting companion piece with Leo McCarey's 1937 Make Way for Tomorrow, which supposedly inspired Ozu to create his film. Both stories feature an old couple going to stay with their busy and impatient children, who view their elders as an imposition. McCarey's movie, while quite stark and honest within its context, is still very much a Hollywood movie with a stylized sense of storytelling and a heightened sense of drama. Ozu's film is far more consciously low-key; there are no real flare-ups or confrontations, tensions exhibit themselves more passively and the old man and woman rarely articulate their concerns (and only cryptically, with a sad smile, when they do). On the other hand, the children do voice opinions, continously - not so much to their elders, but amongst one another. This is a very Japanese element to the story - it's as if the old couple, and perhaps Noriko as well, are trapped in the wrong movie. They believe in the values Ozu usually espouses, of acceptance and restraint and stoicism, while their children rush about restlessly, getting things done, and bluntly indulging their irritations and impulses. The oldest son, a doctor, has a no-nonsense bedside manner; he is never rude, but he is somewhat indifferent. The older daughter, a vain beautician, is rude - "frank" might be the term she would prefer; chatty and opinionated, she does not seem to have any inhibitions. The younger son is casually flaky, with a few good instincts which he overthrows at the first opportunity. The youngest daughter, the one who still lives at home has a good heart and is the only child who seems to really care about her parents but she is also naive and, in her own way, just as unrestrained as her siblings - as her bitter exchange with Noriko reveals. Only Noriko, the war widow, shares the perspective of Shukishi and Tomi - which, paradoxically, leads her to make excuses for the less grateful and more brash children. Like the old couple suffering silently from their children's indifference, she quietly endured a difficult marriage to their dead son - this is another bond the three have in common, pain caused by the selfishness of the second generation. It's not as if these characters are simple saints. Noriko is embarrassed by Tomi's admiration, and is not the noble grieving widow they seem to think. She just has a sense of dignity. Shukishi, it is strongly hinted, was an alcoholic and even as an old man he gets stinking drunk and inconveniences his daughter. Sitting at the bar with his friends, we see him let loose for the first time, bemoaning his kids and indulging his whims. Perhaps there is a little of the father in the children after all - but the difference is that the father corrals and controls this impulse, channeling it into drinking nights instead of letting it define his whole life. This may not be a better solution but it is evidence of a desire, at least, for self-discipline and endurance. Finally, the title of the film is notable in setting the tone and defining the mood: Tokyo Story - in other words a story not about the old values and traditions of the main characters, but the fast-paced, rather indifferent, modernizing and Westernizing world of the children. So even though we are with Shukishi and Tomi throughout (occasionally cutting away for elliptical revelations), we are as overwhelmed and frustrated as they are by the environment. This is one of the least harmonious Ozus I've seen, which is why it certainly is not archetypal (and perhaps why I find myself less attracted to it than others) but also why it is so interesting, why it stands out. Most of Ozu's fifties film deal directly with the changing society, but they do so from a cautiously optimistic, or at least accepting, standpoint. Even the sad conclusion of Late Spring has a note of calm, peaceful surrender (besides, it is an old value, not a new one, which has triumphed). Tokyo Story lacks that standpoint - it is Ozu's most pessimistic film. The disappointed smile is the most we can hope for in a world that seems as alien to Ozu as to his heroes, however perfectly he captured it.